(500) Days of Summer is a film which I constantly go back to, because it makes me laugh and cry and feel happy and feel sad all at once. It is so beautifully made, too. I mean, it has a dance sequence in it, and there's that expectations/reality scene. It makes me a little angry that Marc Webb went on to direct The Amazing Spider-Man after this. I mean, I'm happy that he's deservedly moving onto bigger things, but I don't think blockbusters are really his forte. Indie films like these are. And I'll love Joseph Gordon-Levitt forever. Amy Adams is probably my favourite modern actress. I've seen her in just about everything, and moreso, I've never been disappointed in her work. She's just so bright and bubbly, and she always brings that loveliness to whatever she's in. While she's built her career on being squeaky clean and innocent (mostly thanks to her Oscar worthy turn as a real-life Disney princess in Enchanted), she's not really afraid of much. She just keeps getting better and better. Admittedly, Batman's inclusion in this list is because I would have ended up putting all of Nolan's Bat trilogy in here somehow, so I thought sticking it under 'B' was the best. I did like the previous versions of Batman's story (Batman & Robin is a masterpiece, hahahaha), but Christopher Nolan's reworkings are among my favourite things ever. I love The Dark Knight the most, but I have a feeling that a few more watches of The Dark Knight Rises might alter that. Batman Begins was exceptional too, but something has to come last. This one is an obvious choice. I may not be the kind of fangirl who sends critics death threats because they don't like one of Christopher Nolan's films, but I do love him more than most things on this Earth. He's just so awesome. Like, he just walks around, as cool as a cucumber, wearing his suits even though it's the middle of Summer. And when he talks about films and stuff, he's so articulate. Plus, his voice is so interesting to listen to because it wavers between a British and American accent. And he doesn't have a mobile phone or an email address because he's just that cool. Seriously, all I want to do is be a part of his family. That's my life goal. David Fincher is just a classy guy. He makes all kinds of movies - usually the kinds that have really sadistic themes - and he makes them with class. He just exudes class in a way that is different to everyone else. His filmography is fantastic, with my favourite of his being The Social Network (I never knew that a movie about Facebook could be that good), but that's followed closely behind by the likes of Fight Club, The Curious Case of Benjamin Button, Zodiac, Se7en and The Girl with the Dragon Tattoo. Ezra Miller hasn't exactly been around for very long - with his debut, Afterschool, originating in 2008 - but with a small filmography he has easily solidified himself as one of tomorrow's biggest talents. His most famous role is probably as Kevin in We Need to Talk About Kevin, a role he played with such terrifying intensity that I still can't shake the film. Now I've seen the large majority of his films I only have The Perks of Being a Wallflower to look forward to, and I'm sure he'll rock in that. Plus, Ezra is an extremely interesting person who generally doesn't give a crap about what Hollywood wants him to be, and I admire that. Because lady power behind the lens is still sadly lacking and one day I hope to join this elite club. Just as a side note: how in hell is Kathryn Bigelow rolling around to the big 6-0? She looks so young! Because Goodfellas is infinitely awesome. And I even managed to not laugh at Ray Liotta once. Okay, that's probably a lie but this film is still extremely wonderful. "I'm Amber, Brad, Tammy, Fender, Brenda, Sketch, Shelly, IQ, Lou-ann, Joey, Mikey, Vicky, Becky, Bix, Jessie, Darla, Paulie, Noreen, Doreen...and I'm *shakes hips* Link." - The fact that I still know this roll call off by heart should be adequate proof of how much I loved - and still love - Hairspray. I know I haven't seen you at all this year, but I will love you forever, Inception. Because my entire world revolves around Jessica Chastain at the moment. And that's probably not an exaggeration. She's absolutely gorgeous, sweet, and exponentially talented. I so wish I could go and see her and my other favourite person at the moment, Dan Stevens, in 'The Heiress' on Broadway. But I'm afraid I'd die of excitement if I was in the same room as them. Aha, didn't see that one coming, did ya? Just in case you didn't know, good old Scarlett O'Hara's (of Gone with the Wind fame) first name was actually Katie. So I thought I'd slip her in here. She may do some pretty silly stuff, but there's no denying she's a force to be reckoned with, and Vivien Leigh was absolutely explosive in the part. I just adore Sofia Coppola films, and this one is my favourite. Plus, I'm going to watch this movie over and over again for the next one and a half months because then I'll know where to go in TOKYO! Ahhhhhhhhhhh, I'm so excited! Memento is my favourite film, so of course it had to be in here. Never Let Me Go is possibly one of the most underrated films of the past few years. It flew under the radar and got a middling response from most, but in my opinion, it was better than the book. That's because of the heart-breaking performances from Carey Mulligan, Andrew Garfield and Keira Knightley, which really should have featured highly in the 2011 awards season. I fell in love with Olivia Williams after seeing her performance in The Ghost Writer, which I still contest is the best performance from any 2010 film. Since then, I've been slowly catching up on her filmography and making sure that I don't miss any of her new performances. She's a wonderful, extremely underrated actress. Paul Thomas Anderson has achieved so much at such a young age. He makes his own brand of films. There will be Blood was a modern epic that felt like it was from another time. Magnolia was a multi-faceted tale that few people could pull off. And now The Master is out and really working the minds of today's audiences. I adore him. Quentin Tarantino is another filmmaker who makes his own brand of films. And I love him for that. Ever since I first saw Pulp Fiction at the age of 12, I've wanted to be QT. I hope that he doesn't retire so soon, because that would be a gigantic loss to cinema. Duh. Ralph Fiennes is my second favourite actor, and a damn fine looking man as well. His performance in Schindler's List is still my favourite performance of all time, and it would take one hell of a performance to even come near its quality. S was a letter I struggled with, because there were so many things I wanted to choose. I wound up choosing Steve McQueen because after only two films, he has solidified himself as one of my favourite directors. Hunger and Shame are beautifully depressing pieces of art. McQueen has an eye for bring beauty out of the toughest things, as evident in his two films. I can't wait for whatever the future brings for him. T was another letter I struggled with, because there were so many options, but Krzysztof Kieslowski's Three Colours trilogy came out on top. It is hard to believe that it has been a whole year since I saw these films, which also managed to change my perspective on films as a whole. They're stunning pieces, with the connections between the three being so wonderfully subtle before coming to a heart-breaking climax. Up in the Air is a film which I constantly go back to, because I love the quick-fire script by Jason Reitman and Sheldon Turner, which is filled with quite depressing social commentary. Vera Farmiga is luminous in this film, too. Of course I had to put in Vivien Leigh in here. This post will tell you why. It is coming up five years since I first saw Waitress, and since then I've watched this film at least 15 times. Which is never a good idea, since I always get depressed because I can't make the pies that Jenna makes. Adrienne Shelly's final film is warmly funny, but also extremely sad. Just how I like it. I could have put X-Men, but I wanted to be different. And if it wasn't for Mean Girls, I wouldn't know that this word existed. I can never wrap my head around how these young people do what they do in films. The under 25 crowd in films at the moment is particularly impressive - and they all seem to be giving the more experienced people a run for their money. After The Perks of Being a Wallflower - which I'm certain we're never going to get in NZ - Zero Dark Thirty is my most anticipated film at the moment. Admittedly because the latest trailer showed off a lot of Jessica Chastain and she may roll her way to the Oscars again, but also because Kathryn Bigelow is behind it. January 31st, I'll be there with bells on. 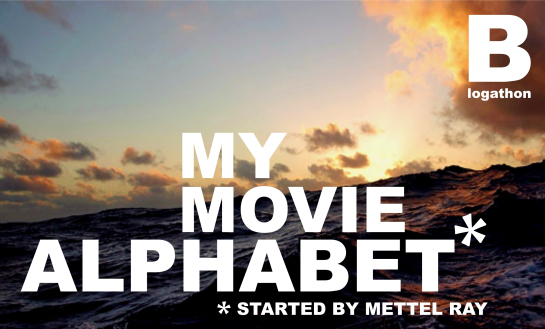 There's my movie alphabet. Have you had a go yet, or do you have some inspiration now? Fantastic list! Damn epic list. I will have to do one of my own at some point, it looks really intriguing and it's a great idea. You'll know that I approve of your choice for T, and pretty much every other choice is good in my book (well, there are a few I don't like, but ah who cares?). Great stuff! Thank you! I think you should definitely do it, it is quite fun (but surprisingly time consuming, haha). Also I might have to rewatch Goodfellas. Haha, that's because we're so alike. And I saw that, thanks! Yay, I look forward to it! Haha, you don't need Photoshop to do this! I like your choice for S. His next movie sounds good (and that cast looks phenomenal), so I have hope for him. I know! I'm really looking forward to it! Great list. I chose Memento and Steve McQueen for very similar reasons. Thanks! I must check out your one now. Woo hoo! The Three Colors trilogy! :) And Chastain! Can't wait for Zero Dark Thirty either. Love this list. I love posts like these... we get to know the blogger on a more personal level. p/s: I've seen Mean Girls loads of times and still don't know that word exists!! I know, they're cool. You should totes do one! HOW COULD YOU NOT KNOW ABOUT XYLOCARP?! Gorgeous post! "Female Directors" is a great choice. Thanks! And female directors are endlessly inspiring, so I had to add them!